I originally wrote this game when I was 13 on my old Amiga 500 in AmigaBASIC and always thought it would be cool to re-write it for Java sometime. Anyway, I made it into a Java applet recently and then modified it for J2ME so it can run on cell phones. 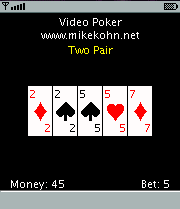 If you'd like to see the applet as it is, you can click on this link: http://www.mikekohn.net/java/poker/. For a more modern version of this game for Android or iOS check my Android/iOS page. Update: July 4, 2007 - Fixed the way the cards draw if the phone can't do transparent png's and if the display is smaller. To play: Press * to set your bet, press # to deal cards, press 1-5 to turn over a card you don't want to keep (pressing that number again will bring it back). Press # to deal new cards and see what you won. To exit the game, you might have to hold down the back button on your phone for a few seconds.